There is no other car quite like the 2017 Volkswagen Beetle near Orlando, especially when it comes to the iconic design. Staying true to its heritage while embracing modern style, the loveable Bug remains a favorite among shoppers of all ages. New this year is the pretty in pink limited edition #PinkBeetle, which adds an eye-catching fuchsia color scheme inside and out. Get more details on the new model in our full-length review below! 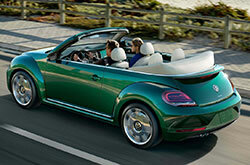 Driving a Bug is a fashion statement and this year's model is sure to give you serious style cred. Updated performance-style bumpers, available bi-xenon headlights, nickname badging and a rear spoiler are just a few of the styling features the Beetle can wear. Additionally, users can select from a rainbow of colors--including the new limited edition Pink Beetle. Both hatchback and convertible models are available in three trims-- S, SE, SEL-- and the Dune and #PinkBeetle special editions. 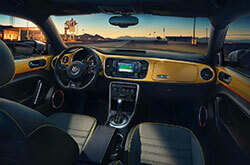 Starting on the base S trim, the Bug is outfitted with a leather-wrapped steering wheel, self-dimming rearview mirror, a touchscreen radio, Bluetooth audio and an 8-speaker sound system. 2017 Volkswagen Beetle reviews applaud the numerous creature comforts added on the next-level SE trim, including keyless access, ambient lighting, heated front seats, leatherette upholstery and a color-matched interior. Beetle fans are sure to love the vintage-inspired look of the cockpit, especially the retro-modern gauge cluster. The charming compact speeds around town with a turbocharged 1.8-liter four that is an absolute blast to drive. Rated at 170 horsepower, the smooth-moving, nimble Bug can be had with a five-speed manual or six-speed automatic with manual and sport modes. 2017 Volkswagen Beetle reviews also note the compact's stellar EPA-estimated fuel economy of 25 city/34 highway MPG. 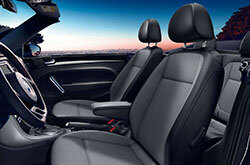 Though the Volkswagen Beetle be little, it is also fiercely safe. The Beetle is designed with seven stability-enhancing systems, an automatic post-collision braking system and a crash response system. A rearview camera is standard equipment on all trims, and SEL trims add a blind-spot warning system, rear traffic alert and park pilot. Additionally, select trims of the 2017 Volkswagen Beetle in Sanford offer Volkswagen's Car-Net Security and Service, which allows users to locate their parked car, check the locks, call for emergency assistance and more. 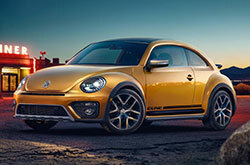 The Volkswagen Beetle Is Finally Here! If you've been looking for new vehicles near Orlando like the 2017 Mini Cooper and the Fiat 500, then you should absolutely take a look at the 2017 Volkswagen Beetle. Its assortment of features and fresh persona may be just what you need in an everyday vehicle. 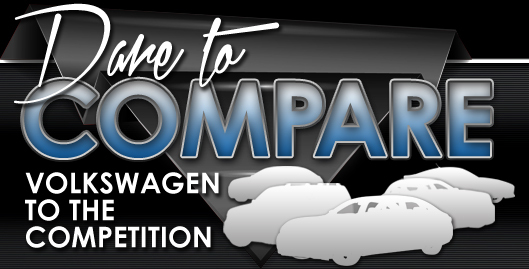 Look over our review and test out the comparison tool to see if the 2017 Volkswagen Beetle is ideal for you. Also view financing and leasing offers while you're here! When you visit our Volkswagen dealership, you'll find manufacturer incentives on a truly incredible range of new and well-maintained used cars, including offers for the sought-after Volkswagen Beetle. To help you make a shrewd decision when picking out your next car, we've included this 2017 Volkswagen Beetle review directly on our site, making it easy and fast to find the details and specs you need. 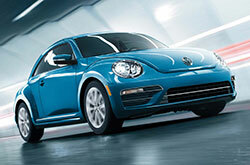 Our selection of handsome Volkswagen Beetle models at David Maus VW North in Orlando, FL is huge. Call to schedule a test drive and come take a look at our lineup. Are you eager to see it preceding your visit? Check out the enclosed video to view its full exterior.